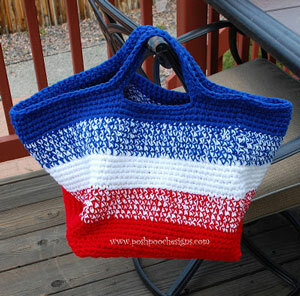 To Market to Market... to Crochet Free Market Tote Bag Patterns! 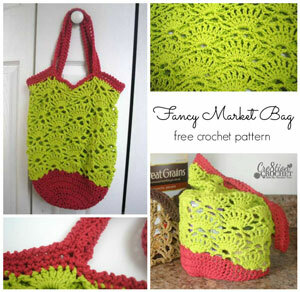 To Market to Market… to Crochet Free Market Tote Bag Patterns! It’s nearly farmer’s market season here in the Midwest US… well, once it finally stops snowing for real… and I can’t wait! There’s just something so much yummier about the fruits and veggies there. But you’ve gotta bring a bag! 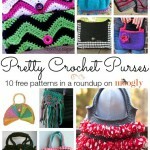 So here are 12 free crochet tote bag patterns ready to take to the market, from some of my favorite designers! 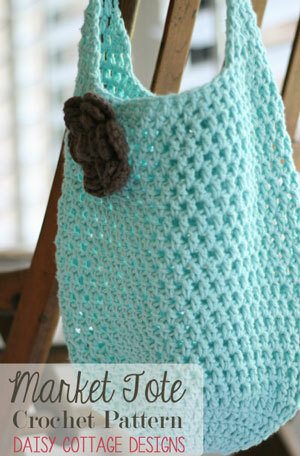 Market Tote by Lauren Brown, on Daisy Cottage Designs: I am in love with this color lately, and the pattern itself is simply lovely! 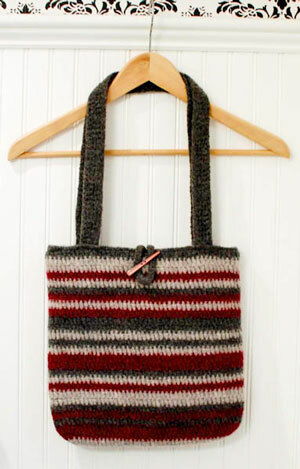 Big Striped Bag by Sara Sach, on Posh Pooch Designs: This bag is big enough to do all the veg shopping for the week! Might want to remove the chihuahuas first though! 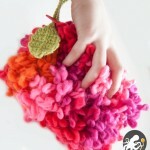 Felted Bag by Kara Gunza, on Petals to Picots: This one is sure to hold up to whatever you dish out, and the felted fabric means nothing escapes! 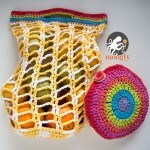 Fancy Market Bag by Lorene Eppolite, on Cre8tion Crochet: A super interesting fan stitch pattern sets this bag apart! 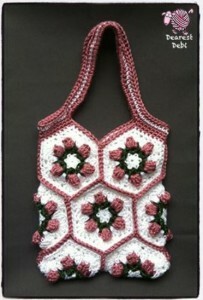 Crochet Flower Bud Granny Hexagon by Debi Dearest, on Dearest Debi: Make the hexies, then make this great looking bag! 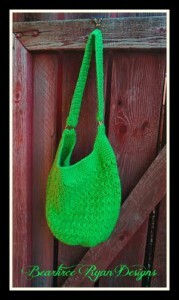 Casual Bag by Sedruola Maruska, on Yarn Obsession: This is the perfect bag for shopping hands free! 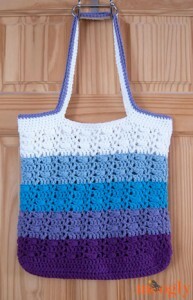 Amazing Grace Tote by Elena Hunt, on Beatrice Ryan Designs: I love the use of metal rings on the handles – looks fab! 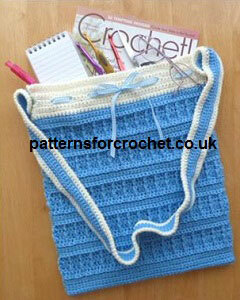 Tote Bag by Patterns For Crochet: This sweet and innocent looking tote includes instructions in both US and UK terms! 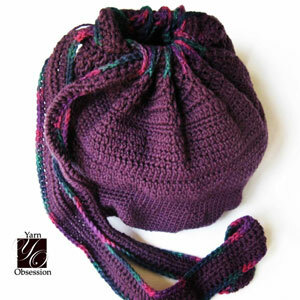 Market Mesh Bag by Claire Sullivan, on Bobwilson123: Love this style for cross body wear! 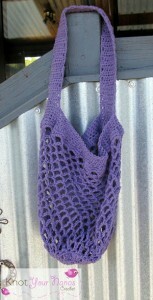 Easy Market Bag by Teri Heathcote, on Knot Your Nana’s Crochet: Simple, easy, and looks fast too! Perfect for last minute making! 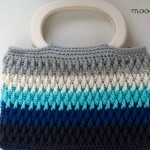 Moroccan Market Tote, by me, here on Moogly: This is one of my favorite stitch designs of all time – great in a rainbow or just two colors! Wrapped Ombre Tote Bag, by me, also here on Moogly: And this is my latest bag – I love wrapped stitches, and have been dreaming of more ways to use them! 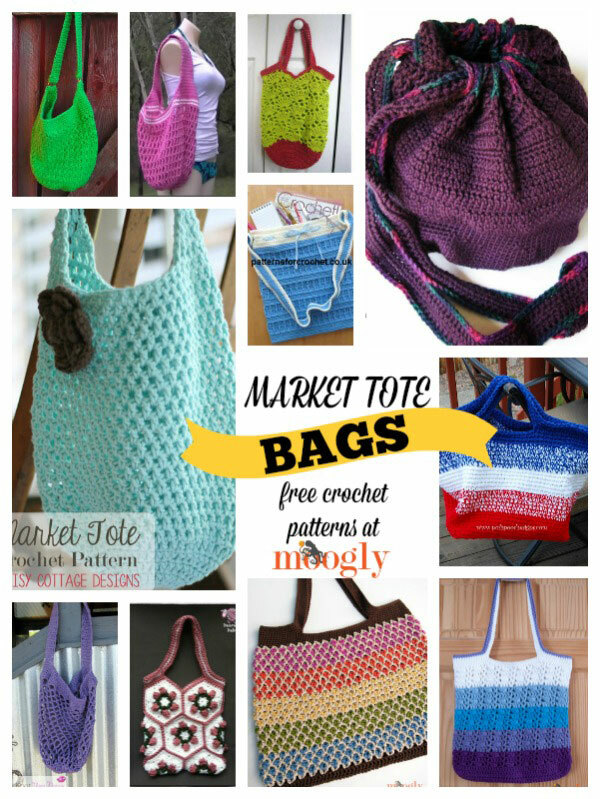 I hope you’ve enjoyed this market tote bag crochet patterns roundup – and I hope you get to enjoy some lovely weather this week! Thanks so much for reading! Facebook, Twitter, G+, Pinterest and Tumblr, and sign up for the Newsletter so you don’t miss a thing! Thanks for another amazing roundup! I love bags! Have you ever done (or seen) a roundup of quick gifts for teachers? Teacher appreciation week is coming up soon and I’d love some help with ideas of homemade gifts to make. Thanks! I .loved all the crochet patterns of handbags but as I am new to the iPad and elderly where do I get the patterns about on the pad? Hello Thomasina! I’m afraid I’m not familiar with the iPad in particular, but you should be able to click on the name of the patterns you like to go to their pattern pages. From there you can make the pattern working directly from the screen, though I’m not 100% sure how the iPad handles downloads. Hi Tamara and Thomasina! I use my ipad for all my patterns. 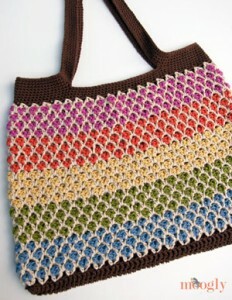 In fact, I created the gorgeous morraccan market tote from your pattern right off my iPad. Just tap on the name of the pattern and it should go directly to the pattern. Then you can work from there or print it if you have an attached printer. The iPad handles downloads much the same as a pc so there should be no problems. Thank you Robin! 😀 It’s hard to give advice on tech you haven’t used lolol. 😀 I’m so glad you like them! Since it’s Earth Day, I have to ask…does anyone know how to make the market bag that is made from plastic grocery bag strips? I saw it made at our local Joann store, but I really don’t want to take a whole class just to figure out how to do it. Any thoughts? It would be great b/c it would be strong AND waterproof too!! The link to number six doesn’t lead to the bag. There was a link on that page, but I’ve updated to a more direct link.